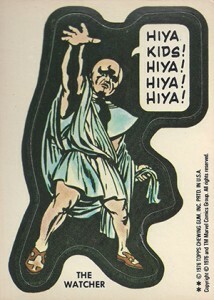 1976 Topps Marvel Super Heroes Stickers is a simple set that highlights the many corners of the Marvel Universe with corny one-liners and dated humor. The fun set is a direct follow-up to 1975 Topps Comic Book Heroes. The 1976 Topps Marvel Super Heroes Stickers checklist has 40 different characters. All are unnumbered. However, they do have the name of the featured hero or villain for easy identification. Each sticker has a die-cut image in the center that is surrounded by a thick black border. Rather than a traditional caption, characters have a speech bubble that comes with a gag that goes against the tone of most of the comics they're representing. Most of these jokes are taken from the pulse of the day. As a result, many are date or work best as a mid-70s time capsule. Six stickers have variations. The following cards can be found with two different captions: The Hulk, Loki, Luke Cage, Conan, Hercules and Volstagg. 1976 Topps Marvel Super Heroes Stickers also has a set of nine puzzle cards. When put together, they form the cover of Conan the Barbarian #1. On the reverse is a checklist. These are similar to the Fantastic Four puzzle cards found in 1975 Topps Comic Book Heroes. While not quite as popular as the previous year's set, 1976 Topps Marvel Super Heroes Stickers still has a decent following. Individual cards are relatively inexpensive. Professionally graded versions have grown in popularity in recent years. The Hulk - Can't Anyone Make Cuffs Right? The Hulk - Help Cure Athlete's Foot! Kid Colt - I Am Not Kidding Around! Goliath - Wanna Hear a Tall Story? Ice Man - I'll Never Eat Another Frozen Dinner! Dr. Strange - Did Anyone See a Flying Saucer? Silver Surfer - You'll Take a Shine to Me! The Thing - Who Said I'm a Falling Rock Zone? The Human Torch - Who Called Me a Hot-Head? 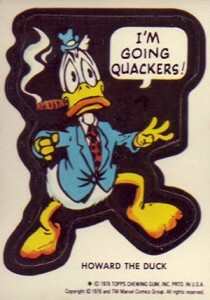 Howard the Duck - I'm Going Quackers! Loki - Who Says I'm Bull-Headed? Sgt. Fury - War Makes Me Fighting Mad! The Watcher - Hiya Kids! Hiya! Hiya! Hiya! Luke Cage - Like My Denture Work? Luke Cage - Two All Beef Patties Please! 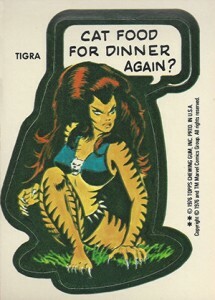 Tigra - Cat Food for Dinner Again? Thor - Don't Make Me Thor! Red Sonja - My Sword Gives Six Extra Shaves! Dr. Doom - Anyone Out There Have a Can Opener? Conan - Hold the Pickle or Else! Conan - Shall We Dance? Son of Satan - Waiter, Bring Me a Clean Fork! The Vision - Who Stole My Yo-Yo? Red Skull - What Makes You Think I'm Angry? Peter Parker - Peter Parker Picked a Peck of Pickled Peppers! Killraven - I'll Teach You to Make Fun of My Hair-Do! Galactus - No, I'm Not the Mad Hatter! The Punisher - Oh Boy! I Win the Kewpie Doll! Dracula - So This is How You Do the Hustle! Blade - I'm a Real Cut Up! Hercules - Like My Nail Polish? Hercules - Look, I Have a Hang-Nail! Bucky - How'd You Like a Knuckle Sandwich? Invisible Girl - I Use Vanishing Cream! Volstagg - I Was a 980 Pound Weakling! Volstagg - Fat is Beautiful! 9 cards. 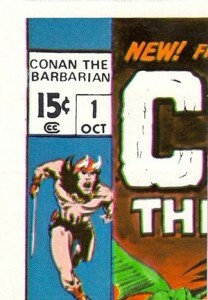 They fit together to make the cover of Conan the Barbarian #1. A checklist is on the reverse of each card. Does anyone recall how many stickers came in one of those 1976 Marvel packs?